Parcel drop box for deliveries. Rotating drum design accepts packages up to 11" x 9" x 7"
Dimensions: 19" x 17" x 40"
Door Dimensions: 12" x 10.5"
Great for a book drop! We received the elephantrunk very quickly and in great condition. The elephantrunk is solid and sturdy. We're very pleased with it. Not always home to receive packages? Trust a pachyderm for the job. Vanessa Troyer and Chris Farentinos know all about the frustration of missing a delivery. After thieves stole packages that were delivered when they weren’t home, the husband/wife team set out to create a secure, convenient way to receive packages and keep them safe from wind, rain, snow, and theft. 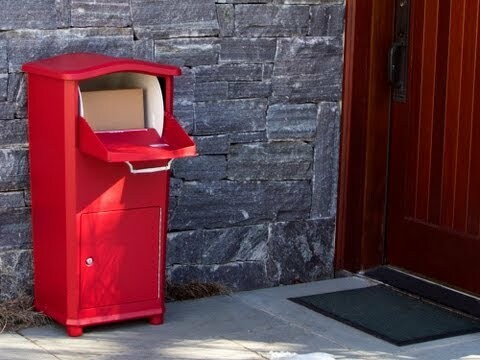 Their invention, dubbed the elephantrunk, is a residential receptacle for envelopes and boxes sent from non-U.S. Postal Service carriers. It has a partition for outbound shipments and a vacation stopper for those times when you’re headed out of town and you don’t want parcels delivered. The elephantrunk is made from cast aluminum and heavy gauge steel, and it has a rotating drum, so packages go in, but they can’t be pulled out by a thief. It also can help keep your house safe from potential burglars who watch for packages that have been sitting out for several days -- a telltale sign that a homeowner is out of town. As online shopping grows, so are the number of UPS and FedEx packages piling up on doorsteps. Thieves have been known to stalk delivery trucks and watch for unattended packages. With the elephantrunk, you can elude these “porch pirates” and entrust your stuff to a pachyderm package-protector.